The cold that’s going around here is said to be a 4 dayer…. today is day 4 and I’m in the sweating out phasen but I’m here… back at the grind and walking in to Kavin’s cocoon he to is at the grind… really… He’s in there throwing sparks grinding and flaking off the chrome on the bumpers prepping the surface to a textured satin black finish. 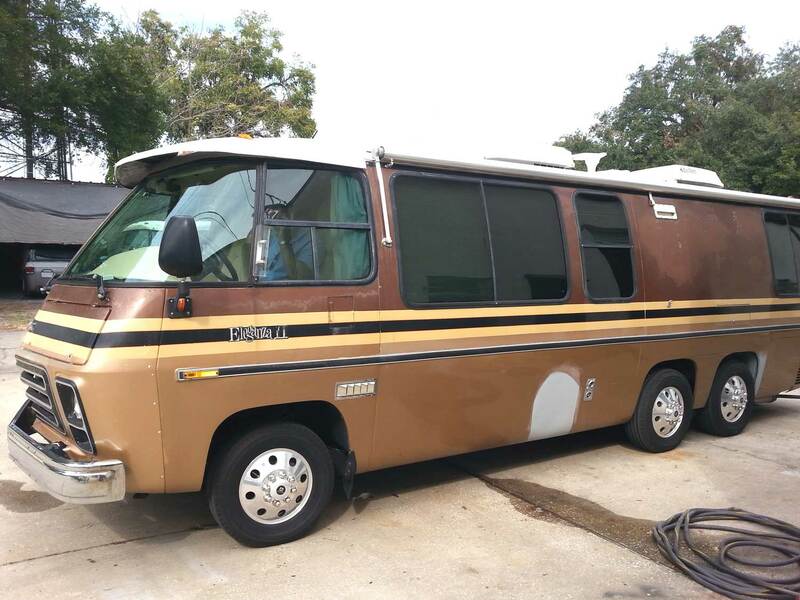 It’s for this baby and as you can see it was attacked by bumper eating microbes We’re prepping this coach up for the owner to sell. 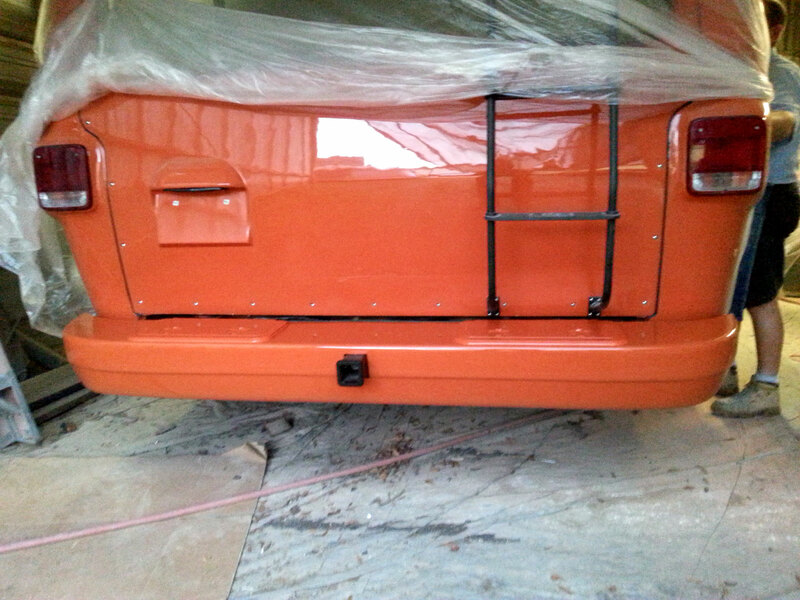 Look, we’re not painting lips on a pig but you would have to agree doing something about the bumpers sure will make a big difference. If you are looking for a descent coach to get into this mess with this could be a good one. lemme know if you have any interes, I’ll do and interior workthrough with it soon.. But the big story today is one of the pics I put on the front page this morning, MoHo’s rear bumper is on and now TELL me that’s not a good lookn bumper With the sealed marine compartment hatches painted and on the bumper now can show it’s stuff . Price? Well, you saw the labor it took to get this finished look, sure, you could scuff it with a brillo pad and foof it with spray bombs but dude… the bumper looks better than to have someone hack it up. I have to tell you this is the most together looking, update to the original body I have seen. Different theories about but I really like the lines of the coach and keeping that in tackt is what this exercise is all about. I’m so happr Ron wanted to go this way. In many ways I think a coach done up like this will be a serious eye catch.. I mean the look of the original coach is why we are all still here! 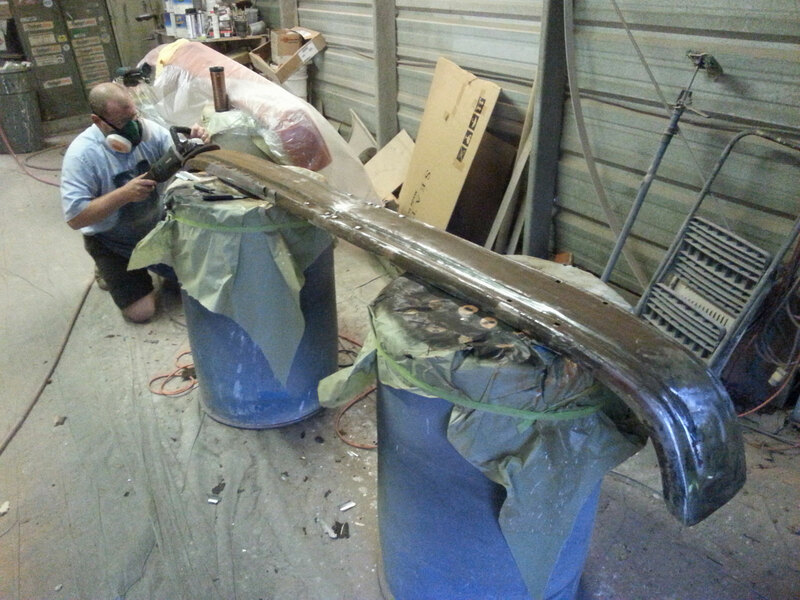 As soon as Kevin gets through some small things backing up like these other rusty bumpers he’s working and Jay’s foofing brown lower sides Kevin will be fitting the front bumper.. it’s been smoothed painted and buffed so it should go on pretty quickly. 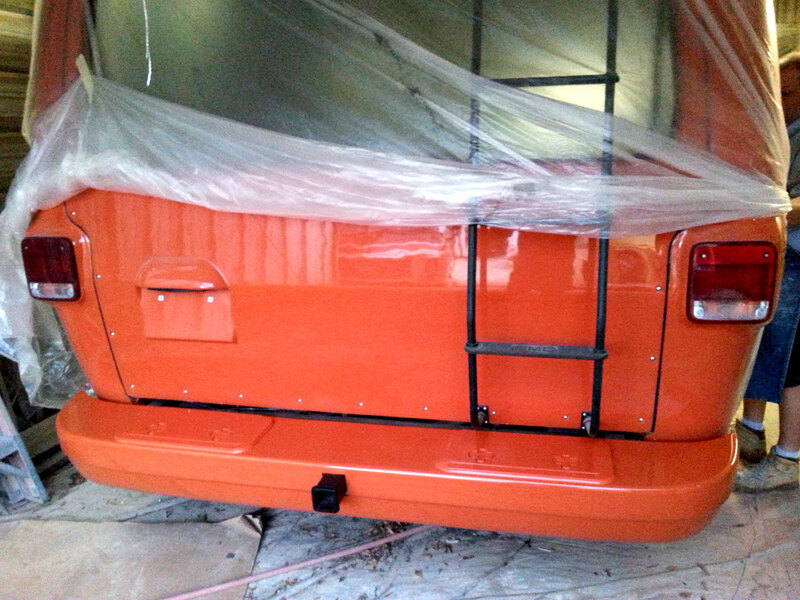 The rear bumper had the thru bumper hitch to deal with. 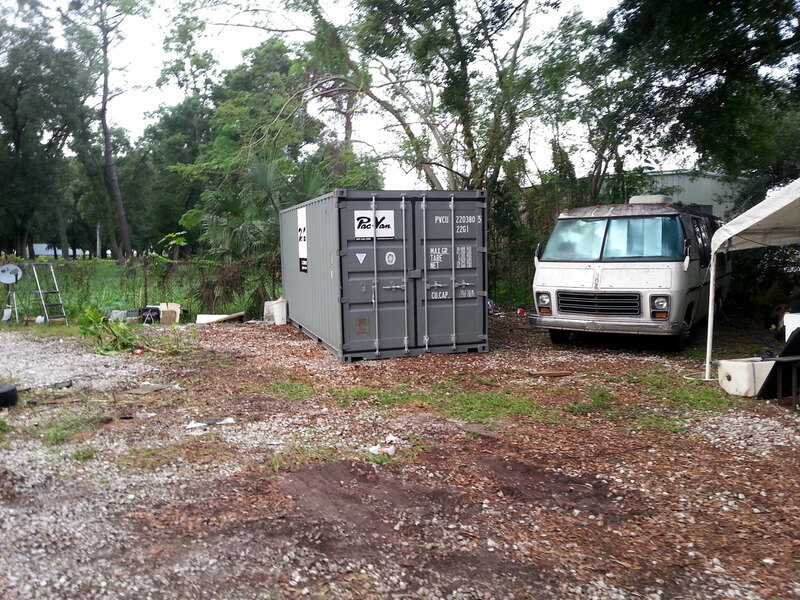 Well, I always used to pupu sesing containers sitting out back of a business…. hey, get a real building…. well now I know why folks do it and here is the first of 2 coantainers we will have at the shop to put some of this crap out of our work space . 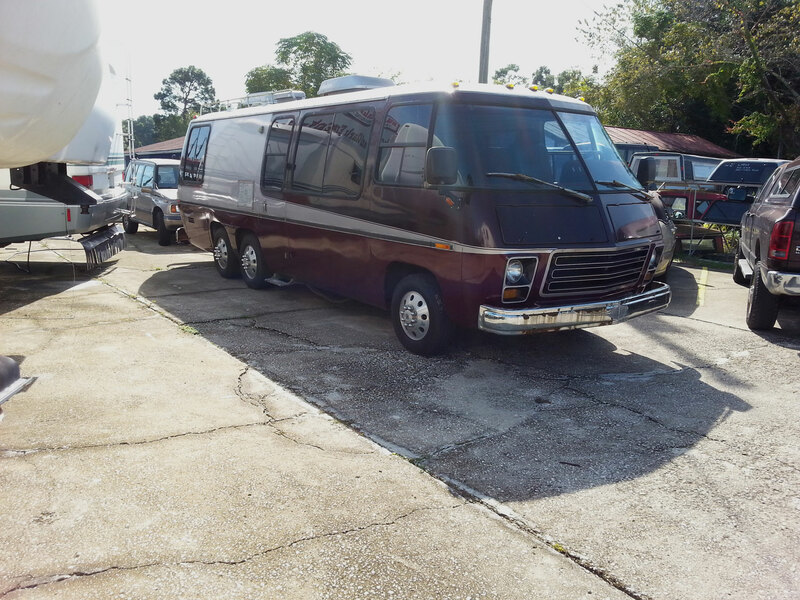 I mean mix a natural hoarder with these motorhomes that have sooo many parts made out of Unobtanium and you get a pile of stuff. My Grandad told me one, “Boy…. if you have a 2000sf house with 1000sf of it clogged with crap…. boy you really have a 1000sf house. Yep, with our fresh trim manager starting yesterday we need to give him the clean space to organize so yeah, I’m now one of those businesses with 2 shipping containers sitting out back. Whatever size you make your shop you will always find it’s too small and getting a building big enough for the mountain of junk you need to keep to do this… brother you simply can’t afford a complex like that! If we were restoring skate boards or motorcycles it would be different… these things take up a large footprint so you need a place big enough.. we may end up with a fleet of these containers but I am committed to get this place ordered. There is so much work now coming in from all of you new owners we need to prepare for the rush. OK, enough for today, I’m not going to push this feeling better today, have a new owner coming in @ noon for the “101 class”…. hey you know what I’m talking about. It’s like breaking a bronco but it’s enjoyable and I feel it makes a difference. To have one of these machines … hey there is a learning curve. Think good thoughts about Sara and her quest to get home, she’s got options and she’s on the move.. awesome. OK see ya tomorrow when container 2 is delivered…..